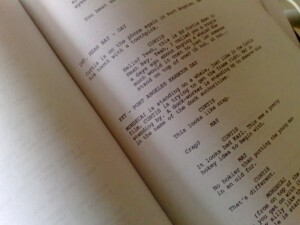 The format and layout for dialogue are similar to that used for a play. You write the name of the character followed by a colon to the left of the page, followed by their dialogue. As the dialogue continues don’t write directly underneath the name so it’s easy to see who’s speaking at all times (see below). 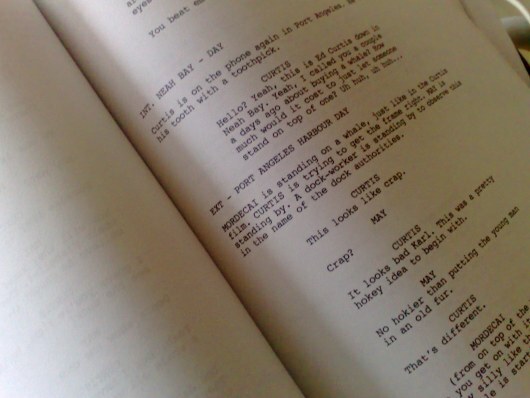 For film scripts, use a separate line for the characters name and centre it, then write the dialogue underneath – as in the picture above! Directions on how to say specific lines are written in brackets. You tell the reader where & when the action is taking place. Int = interior Ext = exterior. Marian is dancing to loud dance music. The door opens but she doesn’t notice. Sean: Hey! HEY LOSER (shouting). Marian: Sean get OUT! Jesus (muttering) can I not get five minutes to myself? Marian goes to dresser, ties up loose hair, switches off iPod dock. Sean: (quietly) Mam needs you downstairs. Marian: (apologetic) Oh. OK. Is she ok? Did she take her tablets? Sean exits. Marian goes to the mirror, looks at herself long and hard, sighs, turns and exits. Marian’s mother Susan is standing under a tree staring vacantly up into the branches. Marian: What are you doing Mam? Sean said you were making dinner? Marian: (distressed) He’s not in the tree Mam. (to herself) He’s not anywhere.